Championing the values promoted in Christian Democracy political ideology, the American Solidarity Party (ASP) was founded as the Christian Democratic Party USA in 2011 and was later renamed as the American Solidarity Party in 2012. 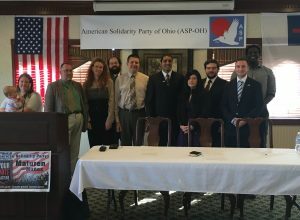 In our state, the American Solidarity Party of Ohio (ASP-OH) became established in July 2016 under the leadership of Dr. John Das, who served as its first Chairman. The first State Committee also included Mr. Robert Vandenberg (Vice Chairman), Mr. Michael Korson (Secretary), Br. Brennan Baker (Treasurer), and Mr. Tedros Hailu-Mitiku (Chief Diversity Officer). On October 22, 2016, the American Solidarity Party of Ohio held a well-attended first annual statewide meeting and in the 2016 Presidential Election, it was able to secure close to one thousand votes for the American Solidarity Party presidential candidate, Mr. Michael Maturen. From the date of its founding, the American Solidarity Party has grown exponentially and continues to do, with people from all walks of life joining and spreading the message of a consistent life ethic, economic justice, and creation care. ‘Christian Democracy’ is a political ideology that became prominent in the twentieth century after World War II, when Roman Catholic and Protestant political activists worked to restore order in a broken Europe. Christian Democracy was influenced by Catholic social teaching and became prominent after the release of papal encyclical Rerum novarum by Pope Leo XIII. At the same time, Christian Democracy was shaped by Neo-Calvinist theology, as espoused by Abraham Kuyper. Christian Democratic parties came to power in various countries of Europe, as well as in Latin America, where they emphasized several unique concepts that promoted the common good. The American Solidarity Party (ASP) identifies itself as a Christian Democratic political party. As such, the concepts of Solidarity, Subsidiarity, Sphere Sovereignty, Cultural Mandate, Preferential Option for the Poor, Distributism, Stewardship, and the Dignity of Labor are relevant. The teaching of Solidarity emphasizes the interdependence of human beings with one another, and with God. To be succinct, solidarity upholds the view that we are members of one human family designed by a loving Creator. Subsidiarity and Sphere Sovereignty are two other related concepts that are emphasized within Christian Democracy. Subsidiarity teaches that higher levels of government should only address those issues that cannot be solved at the local level. Sphere sovereignty likewise emphasizes the fact that each sphere of life has its own responsibilities and authority, with each sphere of life being equal to one another and all spheres being under the dominion of God. Cultural Mandate refers to the societal promotion of and respect of the moral law contained in the Decalogue, which originates justice that values the protection of all people. The preferential option for the poor refers to our obligation to care for the poor and vulnerable. Distributism refers to an economic system that promotes the spread of the benefits of freedom and economic initiative as widely as possible, rather than being under the control of the state or by large corporations run by wealthy individuals. It supports the idea that property ownership is a right. Stewardship, or Creation Care, emphasizes the responsibility of humanity to look after the environment that offers us the resources that we use in everyday life. The Dignity of Labor is another concept emphasized within Christian Democracy that holds work to be good in sustaining civilization. It advocates trade unions as they help in the promotion of a living wage, as well as leave for rest and familial responsibility.